Peter Kimani Launched his novel Dance of the Jakaranda at the Aga Khan University’s Graduate School of Media and Communications in Nairobi on Thursday March 30, 2017. Peter Kimani is one of Kenya’s leading writers and poets with a long history as a journalist and editor. His first entry into the literary space was with his 2002 novel Before the Rooster Crows. His second was for a children book titled Upside Down (2010) which won the Jomo Kenyatta Prize for Literature in the children’s category. His poetry is also highly regarded. He was one of only three international poets commissioned by National Public Radio to compose and present a poem to mark Barack Obama’s inauguration in January 2009. 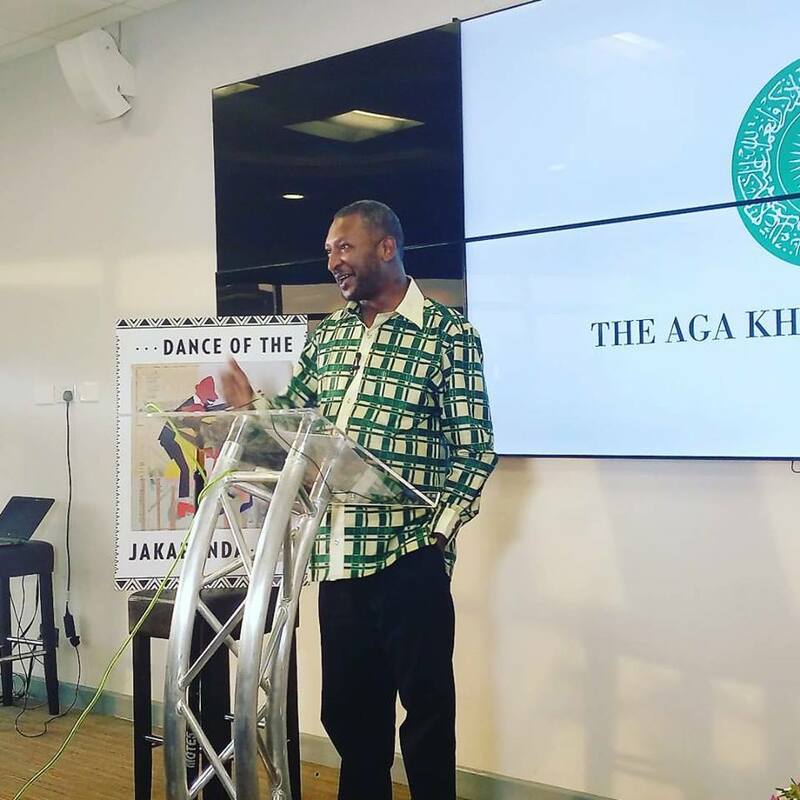 Kimani’s newest novel Dance of the Jakaranda made its official debut in the land of the author’s birth at a ceremony attended by many last Thursday. The book is set in the shadow of Kenya’s independence from Great Britain and reimagines the special circumstances that brought black, brown, and white men together to lay the railroad that heralded the birth of the nation. After speeches by his colleagues welcoming us all, Kimani who isn’t one for long speeches went straight into doing a reading of the book. This was from the opening sequence of the book with our young singer Rajan as he gets a kiss that changes his life. You can hear the reading below. Apologies for video quality as well as the interruptions from texts from the phone. I am scouting for a phone with a better camera as we speak; phone companies with decent camera phones are welcomed wink wink. With the end of the reading the author sought out John Sibi-Okumu who is well known by many Kenyans as an actor, TV presenter, teacher and playwright. He has made appearances in many films the one quickly coming to mind being The Constant Gardner which had actress Lupita Nyong’o on the crew. He is also a playwright with several plays like the award winning Kaggia about fallen Independence Day hero Bildad Kaggia. Sibi-Okumu’s role in today’s happenings were that he was the reader of the audiobook that would be following this printed version of the book. He gave the tale of the meeting of the two and how it all came to be. You can see his presentation below. With the end of this the author then went straight to the most waited for part of the evening; autographs and selfies. In the audience apart from the author’s partner Anne Mawathe were people like Maimouna Jallow, Aleya Kassim, Paul Munene, Kimani wa Wanjiru, and many more. P.S. The book is currently available in Nairobi at Prestige Books at Kshs1,500. Hurry, hurry while stocks last. P.P.S. We read the book. Its’ really good. Pingback: Bookish people host Peter Kimani to Nairobi reading.